Rapid Developments (NI) Ltd Bricklayers Secure Pension Benefits after BATU Intervention. 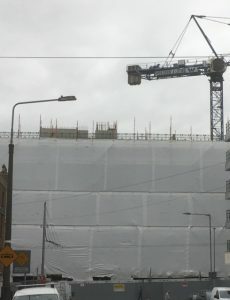 Bricklayers employed on the Walls Construction Ltd project at Lower Dominic Street, Dublin have secured their pension entitlements. Despite an agreement between the main contractor on site Walls Construction Ltd and BATU to ensure that all Bricklayers are paid up members of the Construction Workers Pension Scheme (CWPS), the bricklayers’ employer Rapid Developments (NI) Ltd failed to return Pension payments on behalf of their employees within the required time frame. Following a sit in by the Bricklayers on Tuesday 19th and Wednesday 20th March 2019 and a meeting between BATU and Walls representatives’, backdated payment of several months’ contributions was confirmed to BATU. We urge all members to ensure that they are registered with the CWPS, and contributions paid monthly to the CWPS in order to ensure eligibility for the €100,000 mortality benefit, the ten weeks Sick Pay and Pension entitlements.